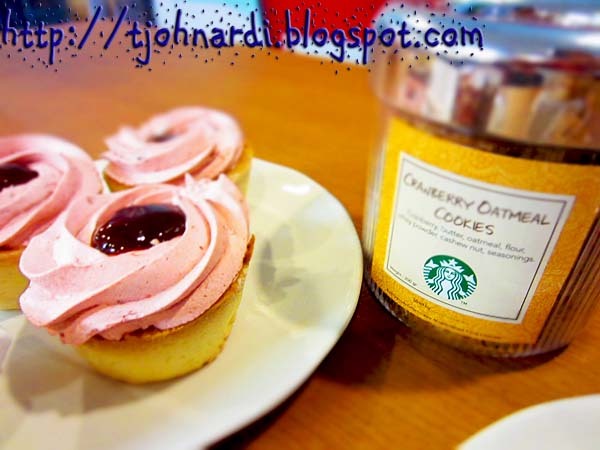 Last Saturday I dropped by Starbucks' Cideng outlet and I discovered that it had just launched the Holiday specials. 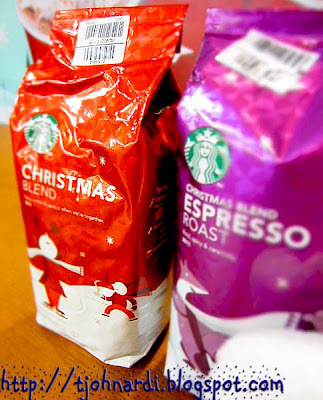 I was intrigued by the Peppermint Mocha (hot), the first of the 3 Holiday variants that I tried. The minty sensation somehow reminds me of the snow that's identified with Christmas. Then my eyes noticed a stack of redemption card, which I inquired to the barista about. Apparently after collecting 25 stickers, we're entitled to redeem one Limited Edition Starbucks 2012 Planner that looked really sleek, with hard cover wrapped in brown suede. I definitely want one of those...haha. 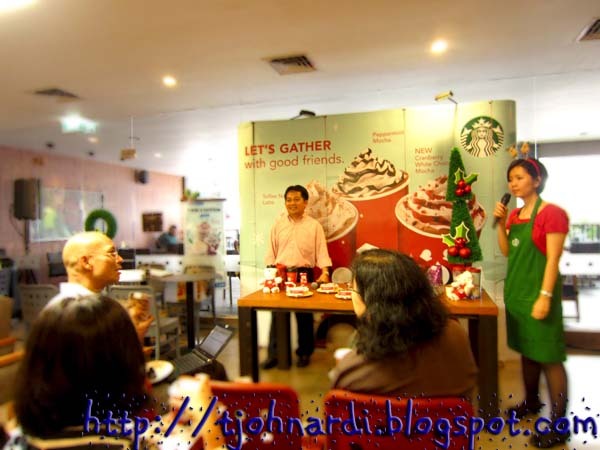 I was very thrilled to be invited by Ms. Corry Tjong (PR & Communication of Starbucks Indonesia) to the Starbucks Holiday Gathering 2011 today, which took place at the recently-opened Tomang store. I finally got to try the 3rd Holiday variant: the Toffee Nut Latte (iced) and I could understand immediately why this flavour is among the all-time favourite Seasonal Traditions. It tasted lusciously nutty and the toffee sprinkle was such a happy ending to the whole concoction. We were next introduced to the Starbucks Christmas Blend by the Coffee Ambassador and got to sample the Starbucks Christmas Blend Espresso Roast. I'm not a fan of black coffee, but the espresso has low acidity and has such fragrant scent, I actually emptied the cup without even adding anything in it! (I've never had pure black coffee in my life before). The next segment was equally exciting: food tasting! After telling us a brief introduction about the theme chosen for this Holiday Tradition, we were served with the food samples. There where Cranberry Scones (which we had earlier with the Christmas Blend Espresso Roast), Holiday Beef & Egg Bagel, Raspberry Temptation, Blueberry Cream Cheese Cake and Strawberry Cream Cheese Cake. 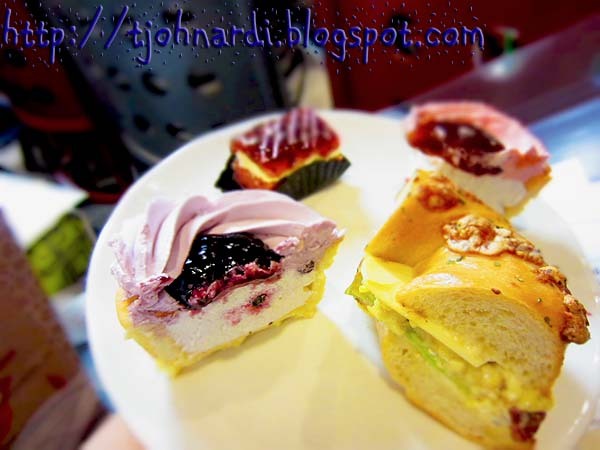 Clockwise from left foreground: Blueberry Cream Cheese Cake, Raspberry Temptation, Strawberry Cream Cheese Cake and Holiday Beef & Egg Bagel. I was actually torn between the Holiday Beef & Egg Bagel and the Raspberry Temptation, because both were so good, but also very different (one salty, another sweet). Although the Holiday Beef & Egg Bagel won the most votes from the other guests, I stayed true to my sweet tooth, and I picked the Raspberry Temptation. 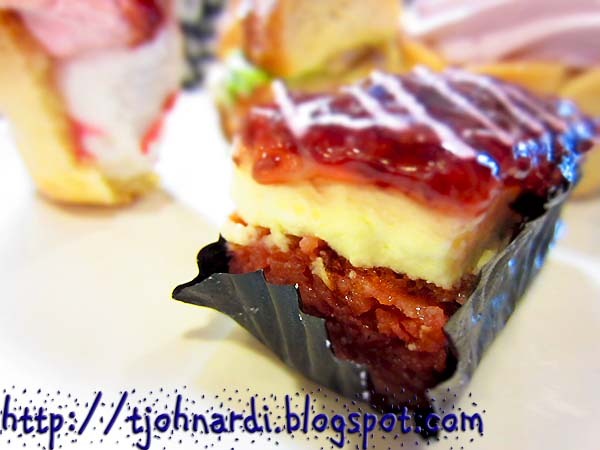 If you look at the close-up image above showing the cross section of the cake, the bottom layer is vanilla sponge cake that's actually moist (I had feared that it would be dry or crumbly), and on top of that was cheese butter cream topped with raspberry jelly replete with yummy berry bits. This cake certainly goes well with the Espresso we had earlier. The goodie bag contained another item of the Starbucks Holiday Tradition series: the Cranberry Oatmeal Cookies. I just couldn't stop eating this treat, which was chewy but still crispy and the dried berries in the cookies were really generous! It's a great gift idea to give to your sweet-toothed special ones this festive season. =) Thank you Starbucks. As Starbucks has >100+ stores in Indonesia alone, I can't possibly list all of them here. So, click this link to its website. Hey! I love their cranberry oatmeal cookies. CAn't stop mumching them.lol.